Quality Home Improvement, Inc takes pride in offering you by far the best installed artificial turf product money can buy. 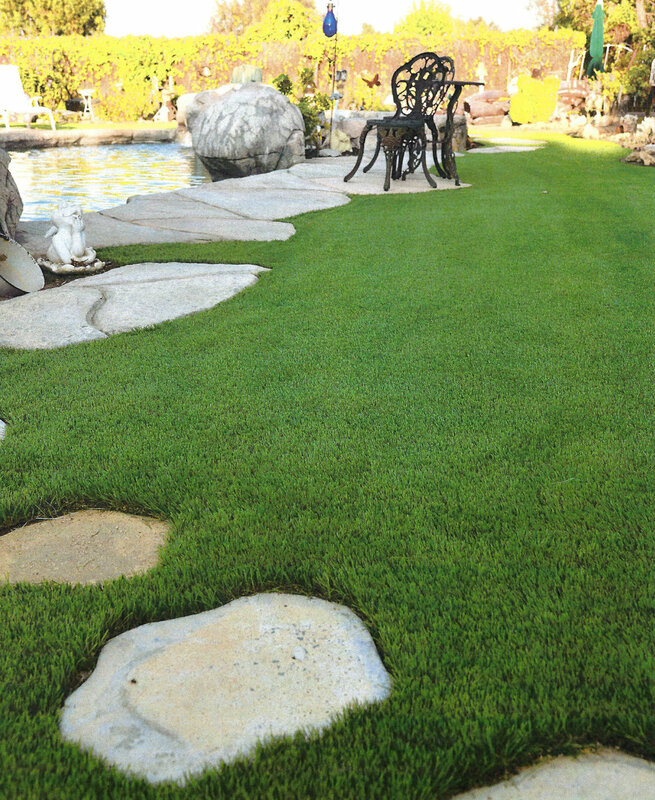 BEAUTIFUL ARTIFICIAL TURF FOR YOUR HOME OR BUSINESS - SAVE ON YOUR WATER / GARDENING BILLS! Quality Home Improvement, Inc takes pride in offering you by far the best installed artificial turf product money can buy. Our knowledgeable team members are well-versed in our products, the technology involved in the production of artificial grass, and the best practices for successful installation. DON'T YOU DESERVE TO HAVE BEAUTIFUL ARTIFICIAL TURF AT YOUR HOME - NICE CURB APPEAL? Installing our artificial turf on your home or business will help you "Avoid" expensive fines from your city or county and it will help you save a tremendous amount of water helping our environment and your wallet at the same time. As the look and feel of synthetic grass becomes more realistic, more and more homeowners are choosing it over traditional lawns, and enjoying the benefits of easy maintenance and reduced water costs. The seeds have been planted and the synthetic lawn movement is growing. Homeowners are finding the benefits in a synthetic lawn, and many are making the switch without looking back. You could say that the movement is a real-life case of the grass being greener on the synthetic side. With much of the western United States in a prolonged and severe drought, the cost and use of water are on the minds of homeowners and politicians alike. In California, the water savings from a synthetic lawn has been enough to drive one legislator to unveil a bill to protect those who want to go synthetic. As much as homeowners might love their traditional lawns, there is a common refrain of sneezes and sniffles around the country as dust and pollen make their way through the air and into our collective noses. Unless there is a teenager around the house who is desperate to make some extra money, nobody enjoys mowing. It’s hot, sweaty, and it’s a constant battle to keep the lawn just the right length. The other issue with mowing is cost. From fuel, maintenance to the mower itself, and time lost crossing back and forth around the yard, it’s not very cheap. In fact, when a homeowner considers that a synthetic lawn can recoup its cost in 3 years or less, while mowing lasts forever, it’s no wonder homeowners are making the switch. As mentioned in point #1 above, much of the country is in drought conditions. Drivers through much of California these days are likely to see block after block of parched, brown lawns. With synthetic lawns, homeowners get a perfect green lawn no matter what. With a synthetic lawn, it’s not just mowing that goes away. Edging, weeding and other time-consuming tasks disappear, replaced by time to admire a gorgeous yard and enjoy fun with family. In some cities, synthetic lawns have been allowed by ordinance, with one of the major benefits being the stabilization of slopes. Because most synthetic lawns must be installed over a soil stabilizing fabric layer, and because water won’t make the synthetic lawn slide away, it can have a great stabilizing effect on a slope or hill. One misconception about synthetic lawns is that they are hot. In fact, a properly installed synthetic lawn in a residential setting will give off no more heat than a standard grass landscaping. In today’s environmental climate, the need for pesticides by homeowners has been diminishing steadily. With a synthetic lawn, the need for costly, destructive pesticides drops to almost nil. Children love to play outside. In most yards, the ability to play depends on whether the yard is wet or dry, hot or cold, muddy or dusty. With a synthetic lawn in the yard, it’s always time to play outside. Gone are the bumps and holes in most yards, replaced by safe, stable footing for the kids to run around. Installing or replacing a natural grass yard is difficult and risky. The seed might not take. Weather might ruin the whole lawn. The dogs might tear it up. With a synthetic lawn, there is no guesswork. It installs in a jiffy, and the family is enjoying a bright green future. Forever Green comes in 69 and 95 ounce thicknesses for maximum reliability. We also carry a 77 ounce pet turf and a 57 ounce putting green. Forever Green comes with a (25) year warranty! Forever Green Artificial Turf is so soft to touch - it's unlike any other artificial turf! It's a beautiful addition to your home's curb appeal! Check out our Platinum Dream, ECO Silver and Platinum Putt and understand why homeowners are choosing the QHI premium turf over any other manufacturer, no one in the industry has a (25) year manufacturers warranty! * No more yard maintenance, no more gardener - $80.00 savings a month or more. * No more harmful pesticides , re-seeding, weeding - $20.00 savings a month. * Say goodbye to your mower and weed wacker - $300.00 year savings in repairs and fuel costs. * No more watering - $50.00 savings per month minimum when you stop watering your grass alone. Save over $2,000.00 a year or more - Go on more vacations, make an extra house payment, pay off high interest credit cards and more! The decision to move to a synthetic / artificial lawn is easy, there are many advantages that will ensure you’ll be happy with your choice for many years to come. "We are writing you to let you know that we are SO grateful for the tremendous job you did on our property's front and back yard. Your company was so simple to work with and you made the entire Artificial Turf project a very easy process. Not only was your staff very friendly, they were extremely knowledgeable in putting together what we were trying to accomplish with out landscaping needs. My husband is VERY happy now that he has his putting green in the backyard next to the pool, and I am happy as well to see him outside with the grand-kids playing golf all together as a family!!!" Thank you for everything and we will be referring your company in the future!!! "What a wonderful transformation, being out in the middle of the desert, we had no driveway or plants whatsoever, everything is just desert dirt. we did not know that having Artificial Turf installed in my front yard could be so artistic and make my house "Stand Out" like this, everyone asks us who did this installation (Both concrete and Artificial Turf), and of course we tell them with excitement and pride, our home looks like a home now"! * Your house makes the payments! * Write off all the interest paid for (15) years! Fake Grass Has Never Looked So Real! Need Synthetic Grass for Your Backyard? We Have Affordable Solutions! Take control and stop those HIGH water usage surcharges!